Pool-in-Wharfedale Church of England Voluntary Controlled Primary School (or Pool C of E to the locals!) is in the Benefice of Lower Wharfedale which is in the Diocese of Leeds. ‘Believe and Achieve’ is our ethos. It is the foundation on which we build lasting partnerships with our pupils, parents and the wider community. We have close links with St Wilfrid’s and Pool Methodist churches, and our values are based on the Christian faith. Through high expectations and a caring Christian environment, we aim to provide the best for our pupils and strive to develop the ‘whole child’. We proudly refer to ourselves as 'The Pool School Family' and instil in all our pupils a desire to look after each other and celebrate diversity. We are always delighted to see you! With your help, we trust your child will be happy and fulfilled at Pool School. We hope you enjoy your visit to our website and that you find all the information you are looking for. Please feel free to leave comments on our page – ‘Working Together’ or contact us directly. At Pool we have a welcoming, happy community where everyone is valued and feels safe. Through our Christian ethos and high expectations, we aspire for all our children to be confident, caring individuals who achieve personal success and a love of learning within the wider community. Every person in our school community has been made in the image of God and is loved unconditionally by God. Everyone is equal and we treat each other with dignity and respect. Our school is a place where everyone should be able to flourish in a loving and hospitable community. Each person in all their unique difference should be able to thrive, irrespective of physical appearance, gender, race, religion, ethnicity, socioeconomic background, academic ability, disability, sexual orientation or gender identity. 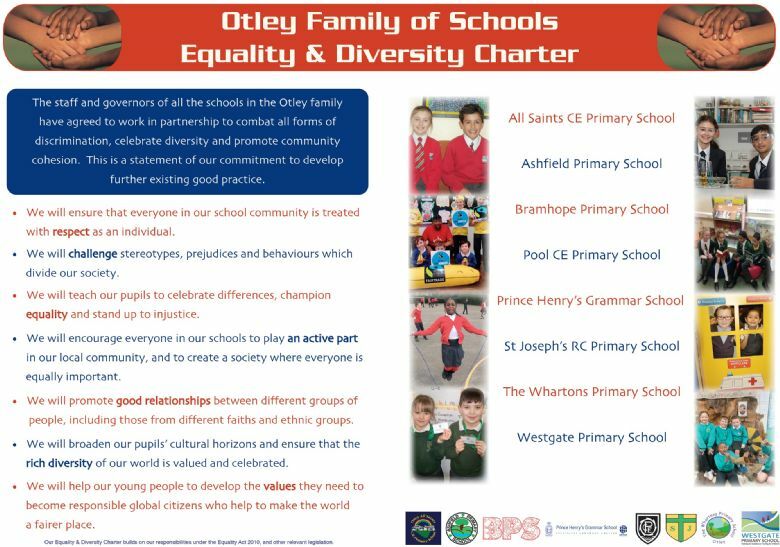 We are committed to promoting the understanding of the principles and practices of equality – treating all members of our school community as individuals, according to their needs, with an awareness of our diverse society and appreciating the value of difference.We actively seek to challenge discrimination and we promote an anti-bullying stance which makes clear the unacceptability of racist, disablist and homophobic, biphobic and transphobic bullying and langauge.